Planning a big day is more than picking the most gorgeous wedding gown and looking your best. I’m sure every couple wants their guests to rave about their wedding! To achieve that impression, it’s important to entertain them well, apart from music. Luckily, the options for that are endless and I’ll try to inspire you with these 5 creative ideas! 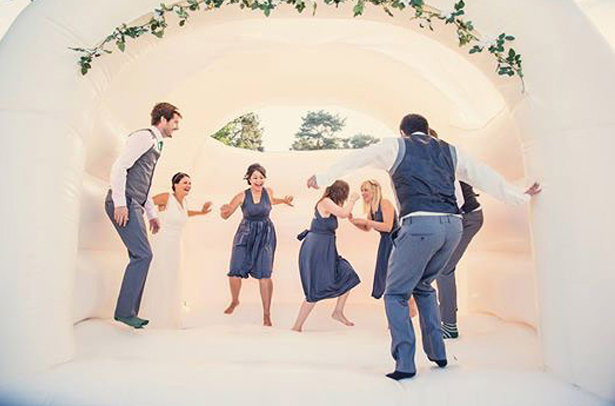 #1 Bouncy Castle – Yes, it’s typically seen as a way to entertain kids, but more eccentric couples will love the idea of bouncing around in their most formal attire. Really, imagine a bride in a wedding dress and a groom in black-tie outfit in such a castle! It could look awesome! #2 Carnival Rides – If you love carnival rides a lot and your wedding takes place near a state fair or an amusement park, think about doing a cocktail hour on slides, Ferris wheels etc. In case you think all your guests will be excited by this idea, consider renting actual rides for your whole wedding. This idea is especially good for summer outdoor events. #3 Fire Show – If your love is on fire, don’t be shy to show it! It might not be allowed in some states in the summertime, but it’s the perfect entertainment option for those who like things a little hot. So, for that extra wow factor that will captivate your guests, consider solo or group fire shows such as JugglingInferno.com. #4 Dancing Lessons – Not sure if all your guests will dance, well make them! If you hire a dance instructor to teach them how to merengue, salsa, swing or boot-scoot, you can be absolutely everybody will be on the dance floor. Do you want your family-in-law to get you know you and your traditions better? Hire dance instructors to teach them your national dance(s). #5 Caricaturist – For a daytime wedding, hiring a caricaturist is such a fun idea! Make sure your caricaturist has a digital camera to get a shot of each work he/she makes.